We offer Nikkiso’s advantaged UV-LED products – all with high performance and reliability at an affordable cost. Along with our sglux UV sensors and probes, Boston Electronics now offers the UV industry the best of breed UV detection and light sources. UV-LEDs are available at standard wavelengths of 265, 280, 285, 300 nm. Arrays are also available, see the catalog. An ideal replacement for mercury lamps, Nikkiso UV-LEDs are earth friendly and can be custom designed for a myriad of applications. See the range of UV LED available and links to the Web Store. Fighting infectious disease with UV-LED light offers great promise to the future of global health. With the ability to purify the air and water, plus decontaminate surfaces, UV-LED contributes to a cleaner world for us to live in. UV-LEDs are great for curing and hardening in industrial applications such as printing and manufacturing. Using UV-LEDs in the laboratory paves the way for new drug discoveries, improved DNA assessment and advanced measurement. The Nikkiso line of UV LED are available for purchase from our web store. Reference the catalog for details , or also click through on the Buy links. Ultraviolet (UV) disinfection technology has been the star performer in water and air treatment over the past two decades, due in part to its ability to provide treatment without the use of harmful chemicals. 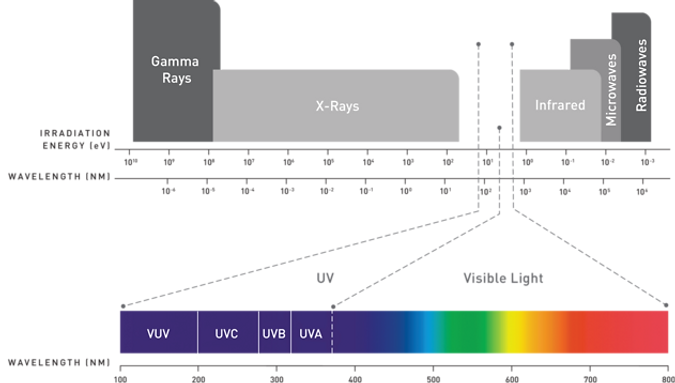 UV represents wavelengths that fall between visible light and x-ray on the electromagnetic spectrum. The UV range can be further divided into UV-A, UV-B, UV-C, and Vacuum-UV. The UV-C portion represents wavelengths from 200 nm – 280 nm, the wavelength used in our LED disinfection products. UV-C photons penetrate cells and damage the nucleic acid, rendering them incapable of reproduction, or microbiologically inactive. This process occurs in nature; the sun emits UV rays that perform this way. UV-LED are used to generate high levels of UV-C photons. The rays are directed at viruses, bacteria and other pathogens within water and air, or on surfaces to render those pathogens harmless in seconds. LEDs are produced by a number of companies globally on wafers that contain up to 40,000 individual LED lights. These lights are measured and categorized according to their characteristics. Each LED device is then packaged to allow electrical connection, thermal management, and physical protection. The UPS Driver can be purchased on the Web Store (Coming Soon).